Home >> Why not start the new school year with a New Year’s resolution? In the article, #20ReasonstoBike: Your kids will thank you for it, HUB Cycling’s Jel Kocmaruk cited a 2016 parent survey which showed that only 25% of Canadian children walk or bike to school, while 58% are driven. In turn, the 2018 ParticipACTION Report Card on Physical Activity for Children and Youth gave Canadian youth a D- in active transportation, meaning we are close to flunking on biking, walking, rolling, scooting to get to where we need to go. But it’s only the beginning of the school year and we have lots of time to turn that grade around. Canada’s physical activity guidelines recommend that kids in all age groups get at least 60 minutes of moderate-to-vigorous activity a day. (Adding more activities, intensity levels and kinds of activities as kids grow). 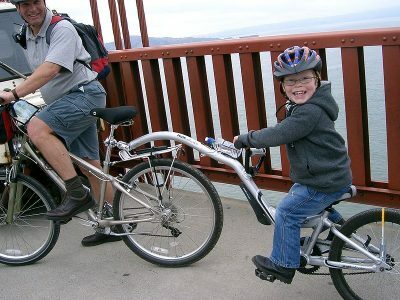 And no matter what the age group – from littles to teenagers to big-kid adults and seniors alike, riding a bike is listed across the spectrum as a great way to get moving and help achieve and maintain good health. But our lives are busy. We are juggling multiple commitments, daily errands and providing for our families. It’s hard to throw one more thing onto the daily “to-do” pile and expect it to get done. So what if we made bike riding, walking or rolling to where we need to go the easiest choice? What if our communities had safe, enjoyable active transportation systems in place? We’re getting there! The good news is there are community champions, organizations and municipal leaders across the province already hard at work building this vision. 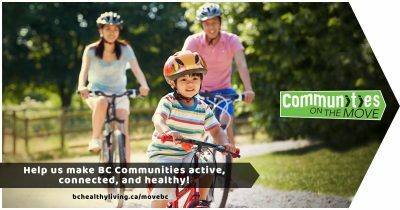 You can join them by adding your voice to BC Cycling Coalition’s email petition and by endorsing the Communities on the Move Declaration for safe, enjoyable, easy-to-use Active Transportation infrastructure for healthy communities. So, why not start this new school year with a New Year’s resolution? Why not challenge yourself and your community to use active transportation once a week and see what happens. Try biking (or walking or rolling or taking transit) to where you need to go, whether that’s the park, grocery store, post office or school. Plan a biking or walking route to school with your kids or with the neighbourhood kids and lead a convoy to better health. In fact, you’d be leading a convoy to a healthier future for all of us. ParticipACTION. The Brain + Body Equation: Canadian kids need active bodies to build their best brains. The 2018 ParticipACTION Report Card on Physical Activity for Children and Youth. Toronto: ParticipACTION; 2018.